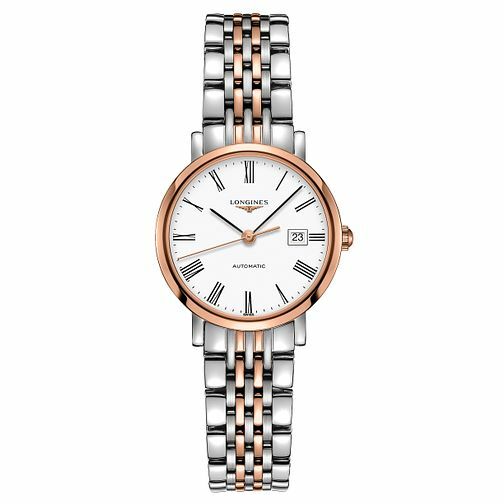 Beautifully distinctive, this sumptuous Longines timepiece from the Elegant collection is crafted in a blend of stainless steel and rose gold plating for a stylish dual tone finish. Offset by a fresh white dial with slender Roman numeral indices, bold black hands and a date aperture, this sleek watch is perfect for the woman who prefers classic glamour. Longines Elegant Ladies' Two Colour Bracelet Watch is rated 5.0 out of 5 by 2. Rated 5 out of 5 by Anonymous from stunning watch I got this watch as a 21st birthday present and am in love with it. I have not taken it off since and will be wearing it for many years to come.